I can't even keep track of all of the rainbow themed items I've purchased this month! My rainbow addiction is truly out of control! Maybe it all goes back to my childhood love of Rainbow Bright or maybe it's just because I love color? Regardless of the cause, I'm truly addicted! It seems like every year Gap comes out with a different version of a rainbow stripe sweater and every year I'm tempted to buy it, although it's not like a need another colorful striped sweater! 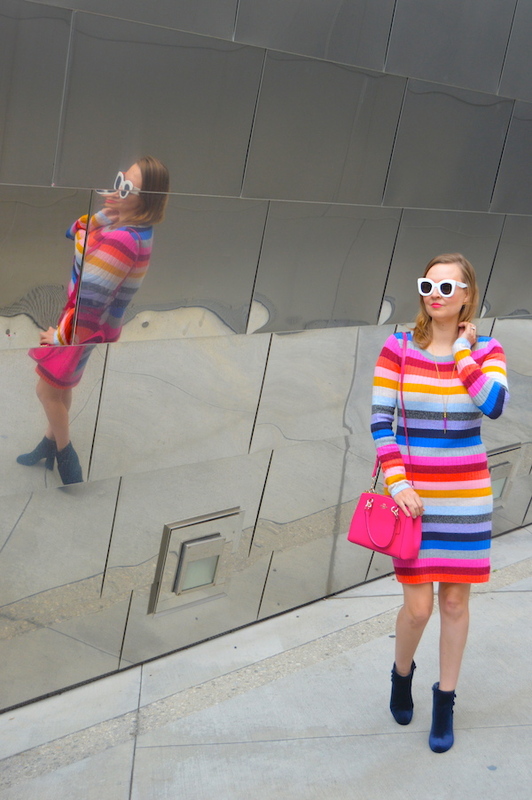 Conservatively speaking, I probably have about five rainbow stripe sweaters! 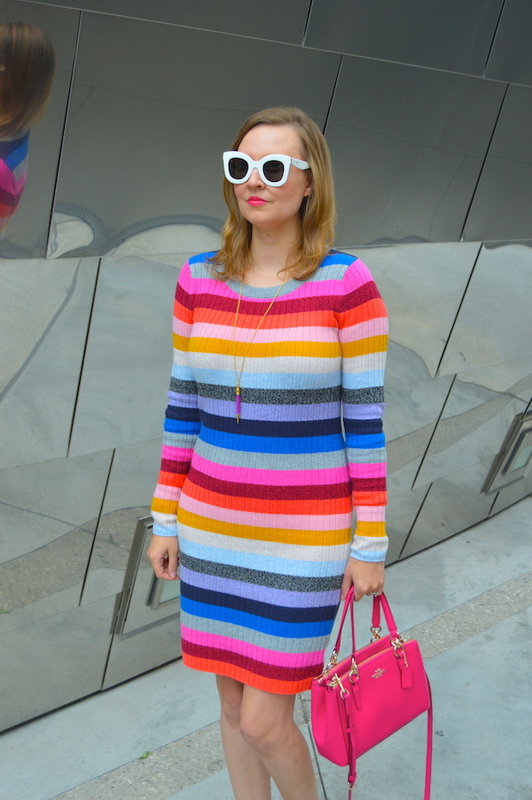 So this time around, I opted for this rainbow "crazy stripe" sweater dress from Gap for something a little different. 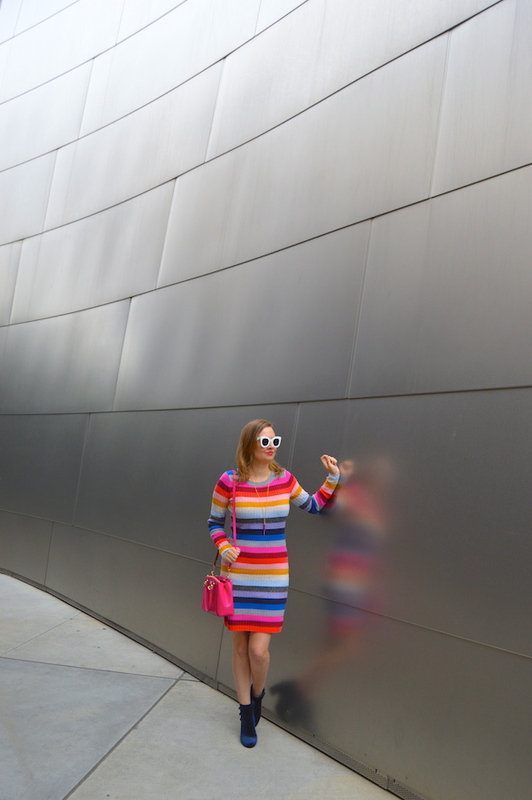 The thing I love about this sweater dress, in addition to all of the colors, is how versatile and comfy it is! I wore this look to go to see a musical in Downtown Los Angeles with my husband. It was somewhat cool and overcast on the day that we went to the theater, so the wool blend material of the dress was the perfect choice given the weather. Also, it was very comfortable for sitting for a long period of time! In the future, I might pair the dress with some navy tights to make it more work appropriate. Last of all, I'm obsessed with these blue velvet booties from Nine West. I wore them in the following post called Blue Velvet where I linked to some of my favorite velvet boot options for fall. Just like the dress, these booties are very comfortable and easy to wear, yet instantly chic at the time. Plus, who doesn't like velvet? They were definitely the perfect accessory to wear walking around the streets of Los Angeles. This dress is SO pretty on you and I just love the title of this post. I used to love Rainbow Bright. Those boots are really, really just perfect too! Okay I love this dress! 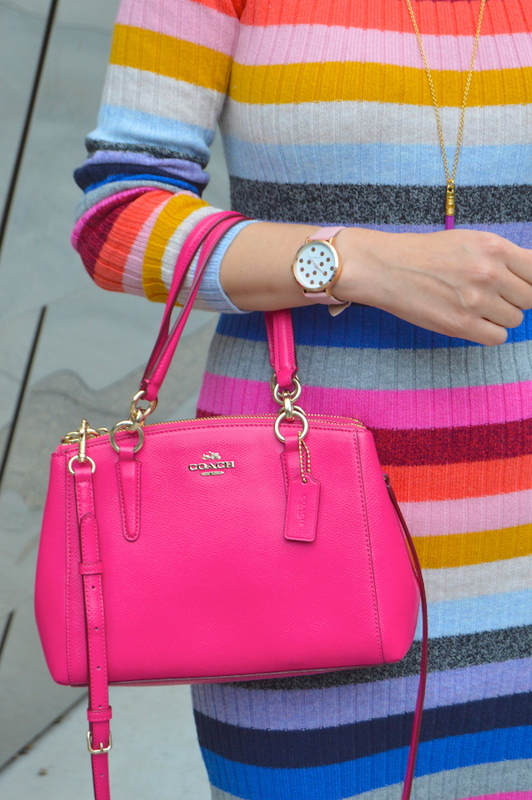 You know how to rock color! What an awesome dress! It's perfect for you and I love the pink bag with it, great accessory choice as always! :) I really need more knit dresses for the cooler months, I don't have any left in my wardrobe which is a shame! I love this colorful looks! Those shoes are absolutely gorgeous paired with it, and it looks so nice with your white sunglasses. This is such a fun outfit!